IIT Kharagpur is one of the most prestigious institutes for engineering in India. 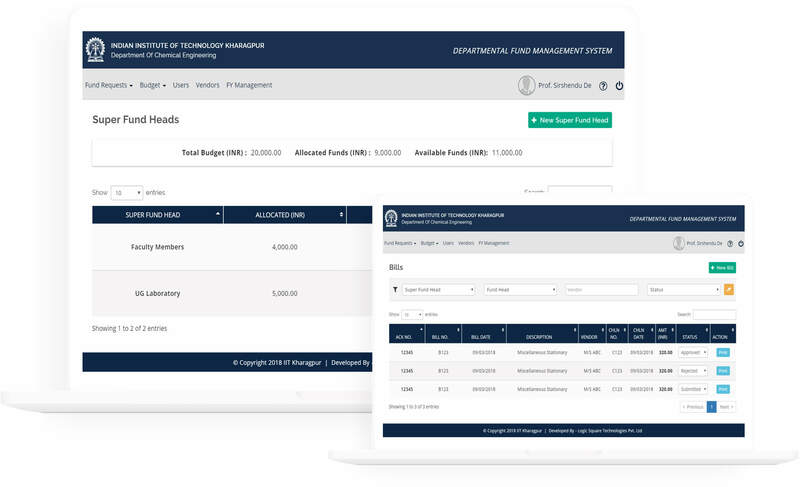 The Department of Chemical Engineering needed a tool to manage budgets, department fund allotment and track research spends. Our tool, Smart Fund Manager was the perfect fit for their needs. Smart Fund Manager is a great budget planning, expense tracker for any institution. Admin (typically the HOD/principal) can invite / manage other users (typically all professors/teachers). They can allocate Top level category funds which can be distributed amongst multiple fund heads(users). This user can report requisition requests against expenses for the fund head. Admin can also manage vendors list, favoring whom the requisition requests can be made by a user. There is a separate equipment grant which is alloted to each individual user for their research / academic purposes. Users may raise equipment requisition request to consume these funds. 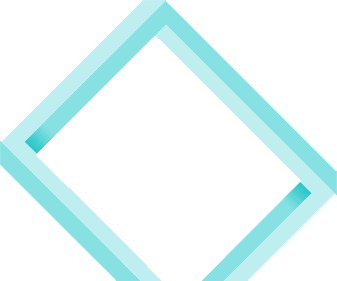 Funds for the super fund head can be distributed among different fund heads and a user can be made incharge of each fund head. 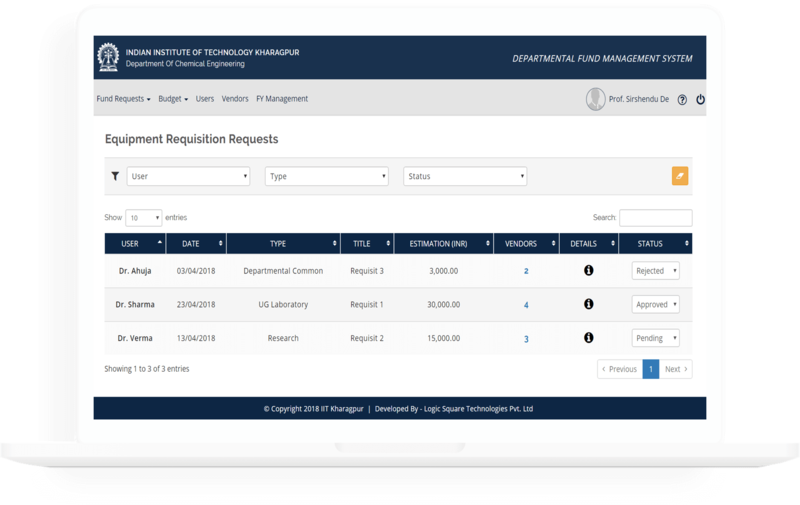 This user can report requisition requests against expenses for the fund head. Admin can also manage vendors list, favoring whom the requisition requests can be made by a user. There is a separate equipment grant which is alloted to each individual user for their research / academic purposes. Users may raise equipment requisition request to consume these funds. Admin can close a financial year and start a new one. A detailed reported for the closed financial year is also made available. Security was a major concern for them as the institute has been the target of a number of cyber attacks and hence they have opted to keep it deployed within their internal network. 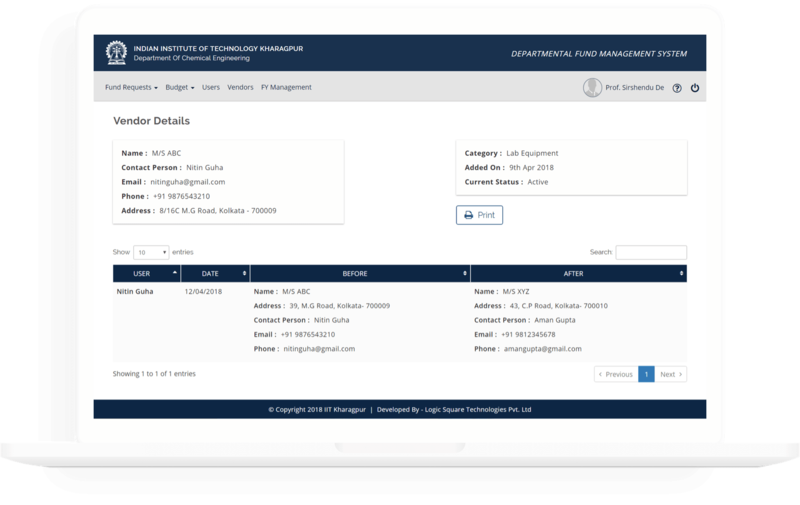 If you are interested in using Smart Fund Manager in your institute, a demo can be made available on request.